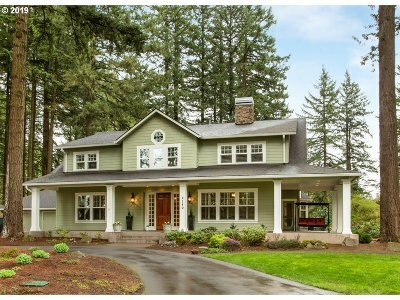 Spacious & Elegant Country Farmhouse - nestled on (just under) 1 gorgeous acre - yet moments from downtown PDX! Built in 2007 - yet oh so vintage... Approx 5400sf. Includes 6 bedrooms, 4 full baths (one on the main), formal living & dining rooms, den/office on the main, kitchen-eating nook-family room combination. Lower level bonus/media room w/storage room (possible gym?). Grand wrap-around front porch & generous patio(s) @ the back.